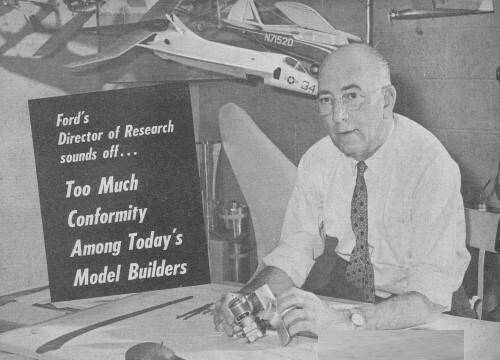 In this article from the August 1959 American Modeler, Ford's Director of Research, Dr. Andrew A. Kucher, laments, as the title suggest, the lack of originality and invention on the part of "today's" aero modelers. Ford at one time had an aeronautics division. He was one of the pioneers of the lifting body concept, having applied for a patent in 1926 based on his research. Dr. Kucher magnanimously offered the technology to anyone interested in developing aircraft that can exploit the phenomenon. Since 1959, many lifting bodies have been built and tested. Dr. Kucher's goal was not necessarily a pure lifting body, but the inclusion of the feature into fuselages in order to assist the wings in generating lift. Look at any of today's fighter aircraft and you will see evidence of his work. 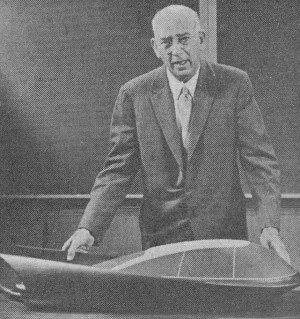 Dr. Kucher (above) with model of Ford's "Glideair" which moves above ground via Levapads. Top shows noted researcher in home shop. 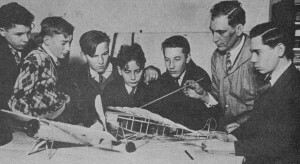 Dr. Kucher (second from right) explains details of model construction to members of Bronx (N.Y.) Model Airplane Club which he organized in 1928. Club grew to 700. Special attraction was watching real planes abuilding at Kucher Airplane Co.
Two years after high school Kucher built this original plane with monocoque fuselage. With 34 hp engine it weighed 380 Ibs. He worked in an undertaker's storage building surrounded -by stacks of coffins; applied final touches outdoors. Third in series of Dr. Kucher's "ray" designs shown above. Intended for the Guggenheim national safe plane con­test, program was washed out follow· ing the stock market crash of 1929. AMA member, modeler AAK, in his Dearborn, Mich., home workshop with latest radio controlled plane. Wing fairing carries out manta ray configuration advocated by Dr. Kucher. Modelers - the group America must depend upon for leadership in the modern age of technology - are letting the country down. That's the opinion of a top auto industry executive who developed his own creative genius through modeling. He is Andrew A. Kucher, who, as a vice president and director of research and engineering for Ford Motor Co., depends upon creativeness and originality to keep his company among the fore­most producers of innovations in trans­portation. Although Kucher's remarks might have been aimed at almost any group of Americans, he directed them at modelers because he felt modeling has proven it­self as one of the richest fields in de­veloping creative technological talent. "I see too much conformity;" he said. "I would like to see more originality and creativeness. I am disturbed, for example, by the fact that European contestants outstripped us in every field in last year's model airplane competition. "This (modeling) is a man's game, too, not just for kids. It develops perseverance in kids which is needed later in life to develop new and better ways of doing things." Most of Kucher's creativeness and originality has been directed toward automobiles recently but it still shows his training and life-long interest in the field of modeling and aeronautics. For example, Kucher led a team of Ford engineers who. developed a vehicle which is supported a fraction of an inch off the ground by air pressure forced through small holes in the bottom of the vehicle. This vehicle, still in the experimental stage, would eliminate the need for wheels on automobiles and greatly reduce the friction drag. It remains a ground vehicle because it relies on the counteraction of the blasts of air against the ground, not airfoils, to suspend it above the ground. But it definitely reflects Kucher's training in aeronautics. 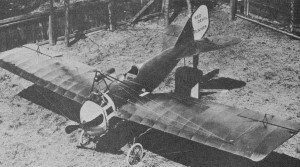 And Kucher's creativeness still is directed almost exclusively toward the field of aeronautics when he tinkers with models during his spare time. He still works on models embodying a principle which he developed as a youth and has been attempting to gain acceptance for ever since. This principle, which Kucher had patented in 1926, gives the fuselage of a plane aerodynamic form along with the wings so the fuselage can help the wings provide lift. A modification of this principle is used in delta-wing airplanes today but this modification does not satisfy Kucher. He points out that his system would allow the fuselage to keep the familiar longitudinal form which provides greater cargo space. Kucher said the general design should have value in development of vertical ascension aircraft because of its high lift characteristics. He has built eight differ­ent models embodying various stages of development of the principle and twice has come close to winning commercial success for it. In 1928, the same year he started his own airplane factory on Long Island, N. Y., to build a two-place, side-by-side, high wing airplane, Kucher narrowly missed obtaining financial backing to enter a plane embodying the principle in a safety contest. As a vice president and director of research for Bendix Aviation Co. in 1948, he persuaded Bendix officials to use the principle in construction of a plane for business executives. Before the plane got into production, however, Bendix decided to stick to building airplane parts, not completed airplanes. 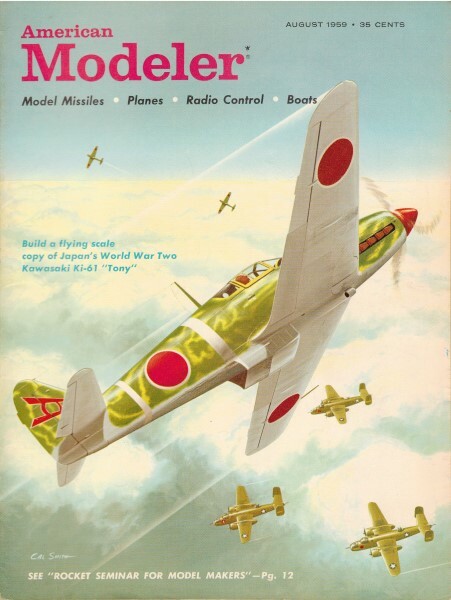 Ignoring any possible personal gain from the principle, however, Kucher has offered his idea to American modelers in hopes of stimulating further development of it and greater creativeness.